July | 2015 | Quo Vadis? will be stepping down from the library directorship on June 30th and will begin a six-month research leave. My official retirement date will be at the end of this year. But I will still be around figuring out what emeritus librarians do and continuing to work on several library projects on a volunteer basis. Anne’s history with the law school began long before her appointment as the director. Anne began as a law student at Rutgers School of Law-Camden, graduating in 1975. She followed this degree with one in library sciences from Rutgers School of Library and Information Sciences, in the meantime joining the law library staff in 1976. Anne worked in the library as a legal research specialist and head of public services until 1992, when she was appointed the interim library director, and officially became the library director in 1993. 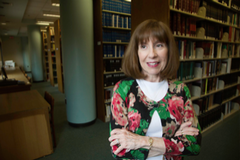 Anne proudly served the needs of the law school through her unwavering service as the library director for more than two decades. Dedicated to faculty services, Anne conscientiously accommodated faculty suggestions and requests to strengthen the library’s collection and library services to law faculty, respectively. Likewise, Anne was constantly thinking about the students and found countless ways of soliciting feedback in order to make the library a more welcoming and supportive place for each successive generation of students. John will be managing the resources and staff of both the Newark and Camden library locations.